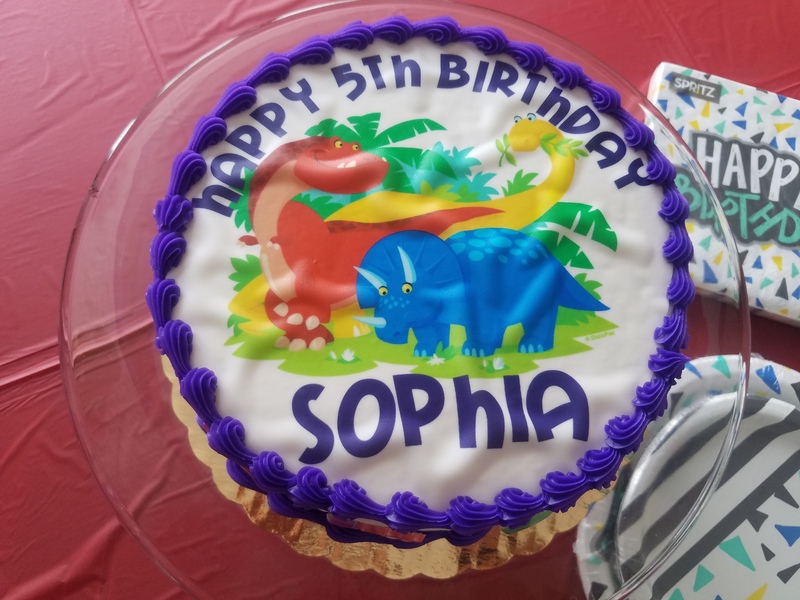 My daughter Sophia had her 5th birthday dinosaur party this weekend. The party turned out great and she had a blast. 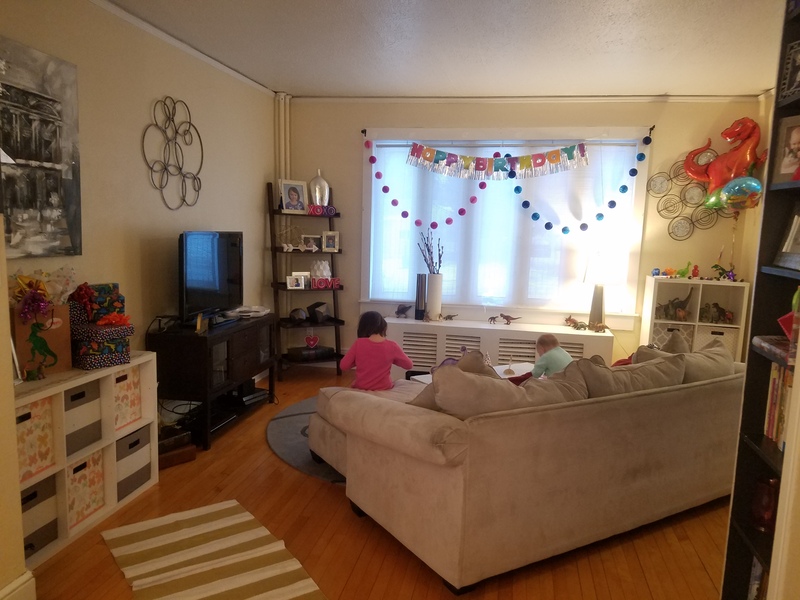 Sophia loved how I decorated the house for her and made it very special just for her. Sophia is a big lover of dinosaurs. 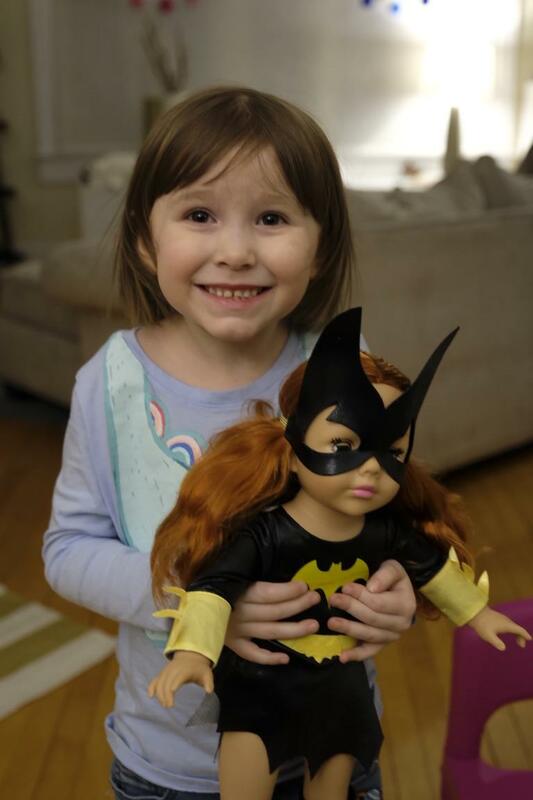 She has a huge collection of dinosaurs she loves to play with practically every single day. Sophia loves dinosaur movies, such as Land Before Time, which she has the collection of all the movies. 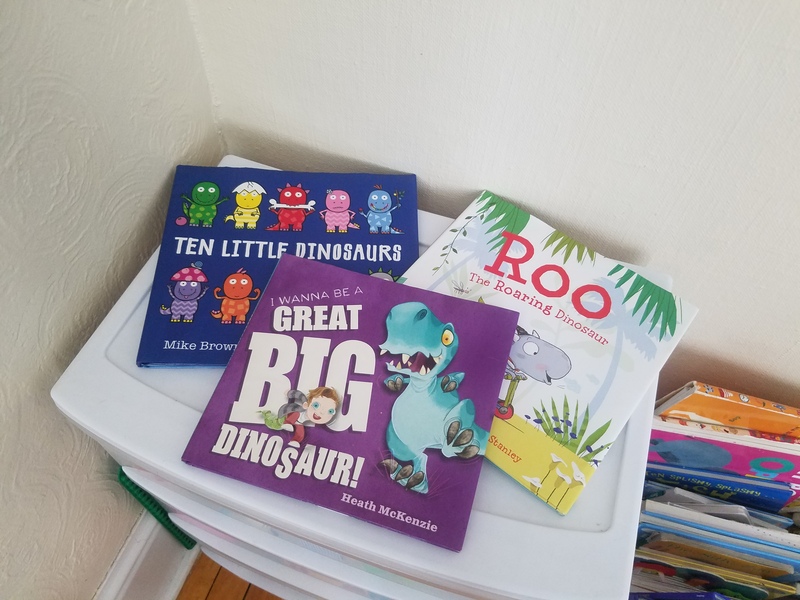 She has several dinosaur books that are her favorite, which I’ll share in a post at another time. As you can see, Sophia loves dinosaurs. 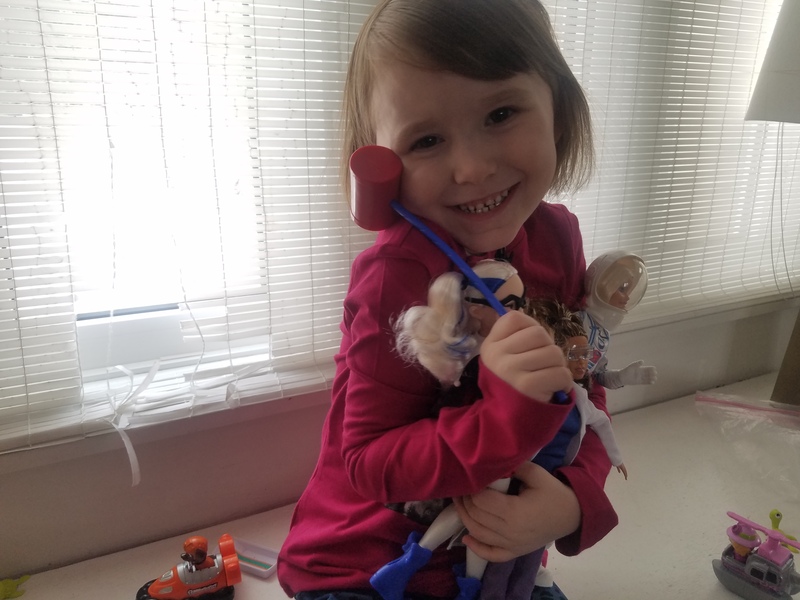 She doesn’t just like them – she loves them. 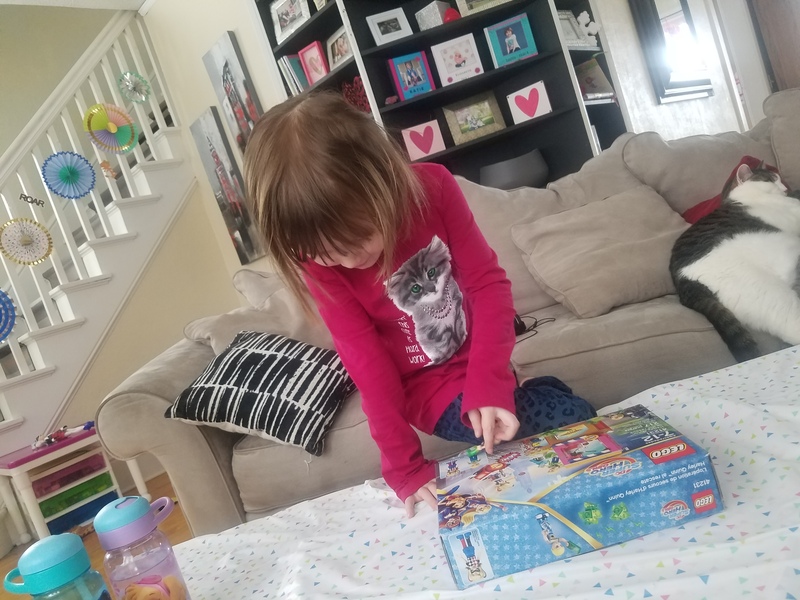 So when Target’s Cat and Jack brand came out with dinosaur themed clothing for girls, we got excited. 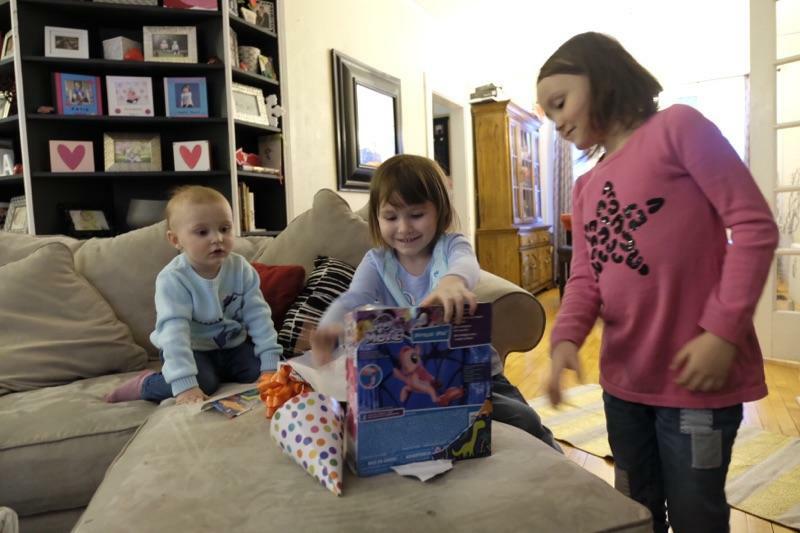 Sophia has several items of clothing with dinosaurs on them. 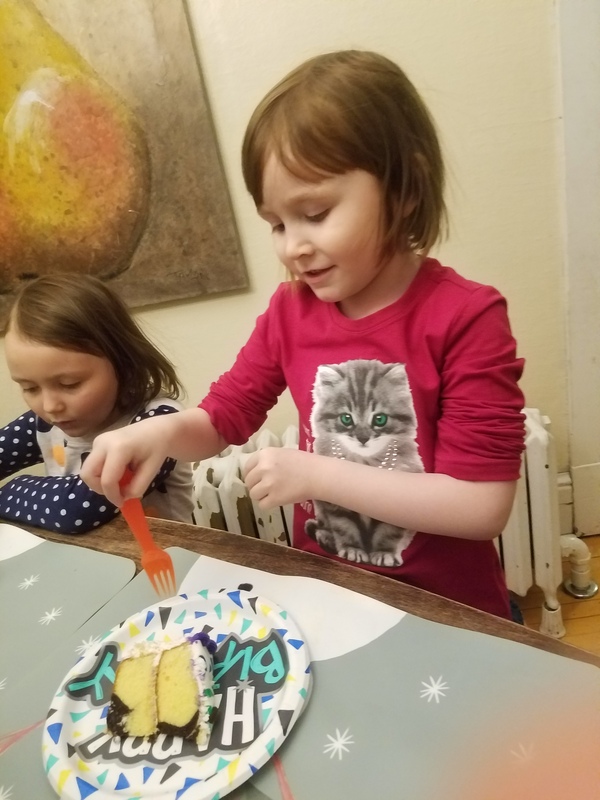 She was able to wear a shirt and jeans with dinosaurs on them for her party. 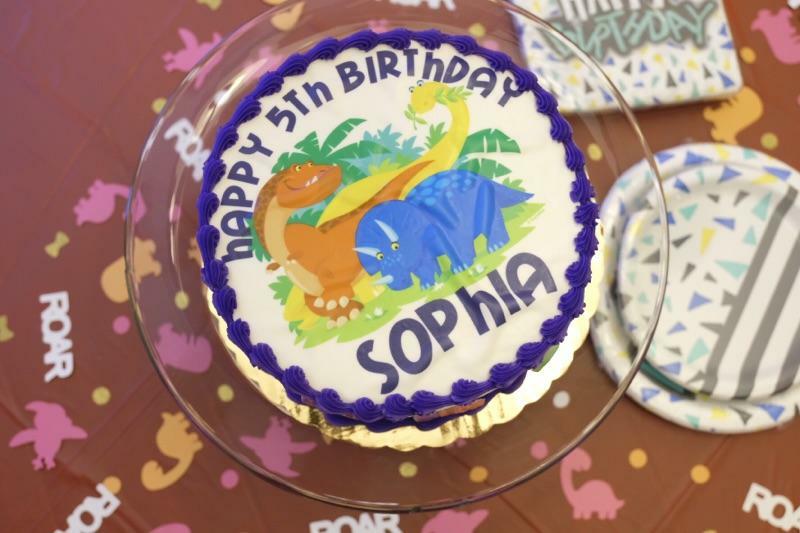 Since Sophia loves dinosaurs so much, that’s why we wanted to throw her a dinosaur party for her 5th birthday. I started out my looking online for dinosaur party supplies. I was hoping to find girl colored ones. But it was hard to find. The supplies that I did fine was either too boyish or too babyish. I did have some luck on Etsy. Spicy Sweet Life had a dinosaur collection for party supplies. I bought the confetti pack, center piece characters, and the roar banner. 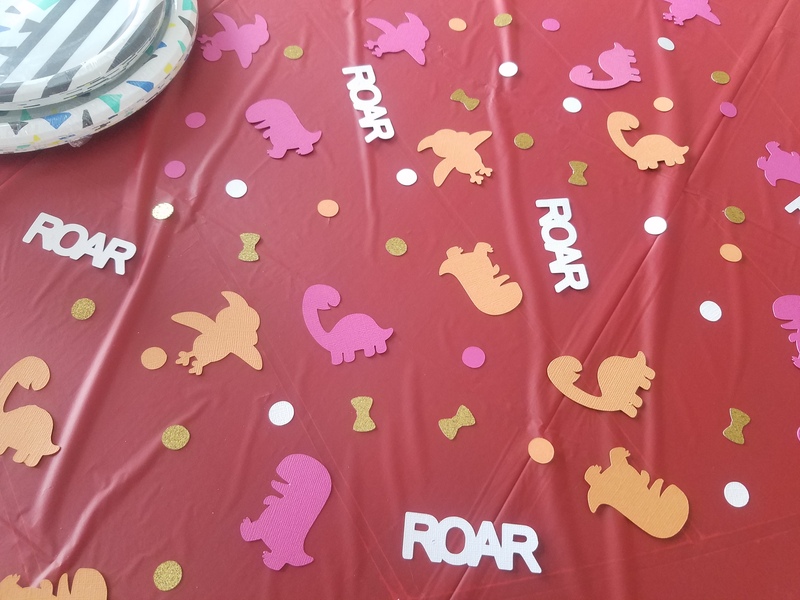 When I went to Target, there were party supplies with triangles, which I thought looked like spikes on dinosaurs or t-rex’s teeth. 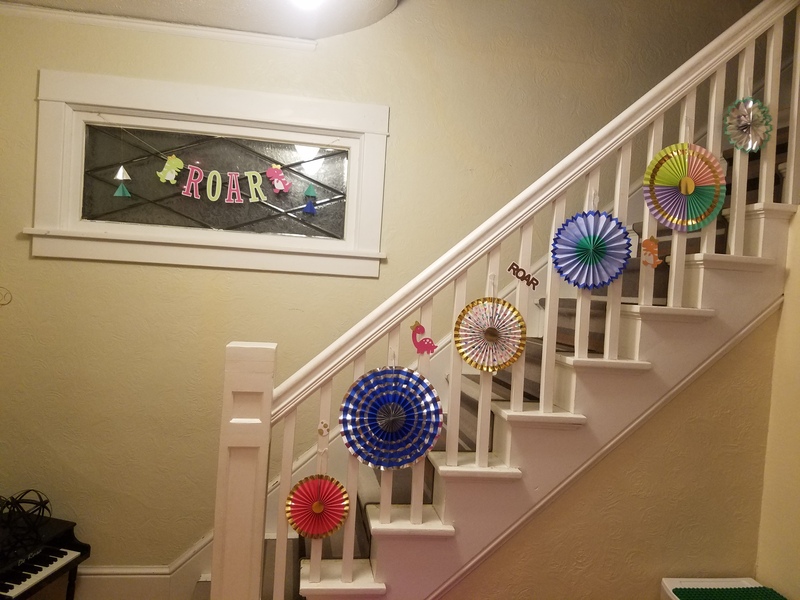 I found some cool fans and several other party decor. 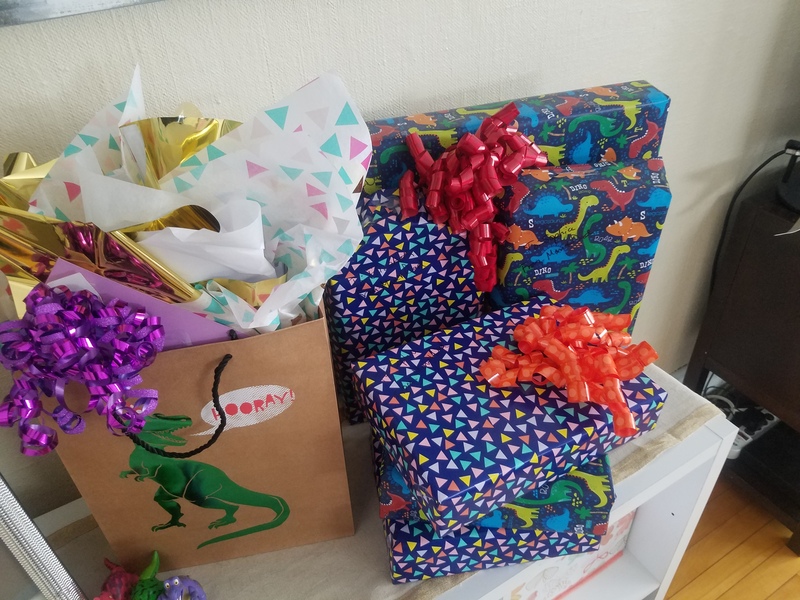 I also found dinosaur wrapping paper to wrap Sophia’s presents. 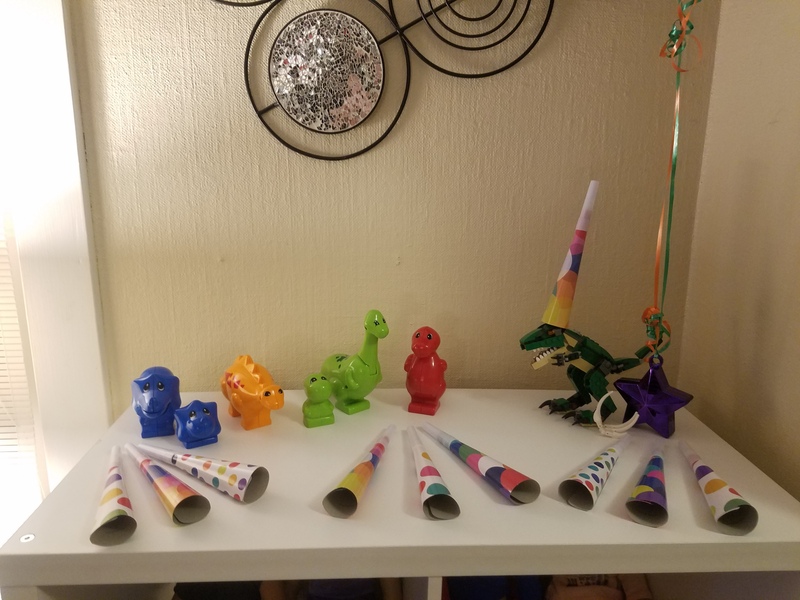 At Party America, we bought a huge t-rex balloon, smaller dinosaur happy birthday balloon, and several other party supplies that matched with the balloons. 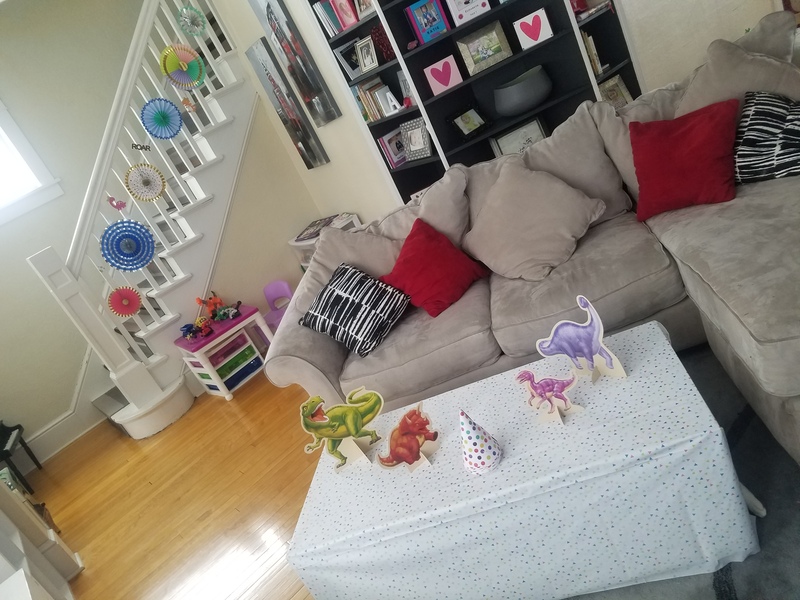 Let’s go through a tour of my living room and dining room decorated for Sophia’s dinosaur party. As you come into my front door, there is a window and stairs. 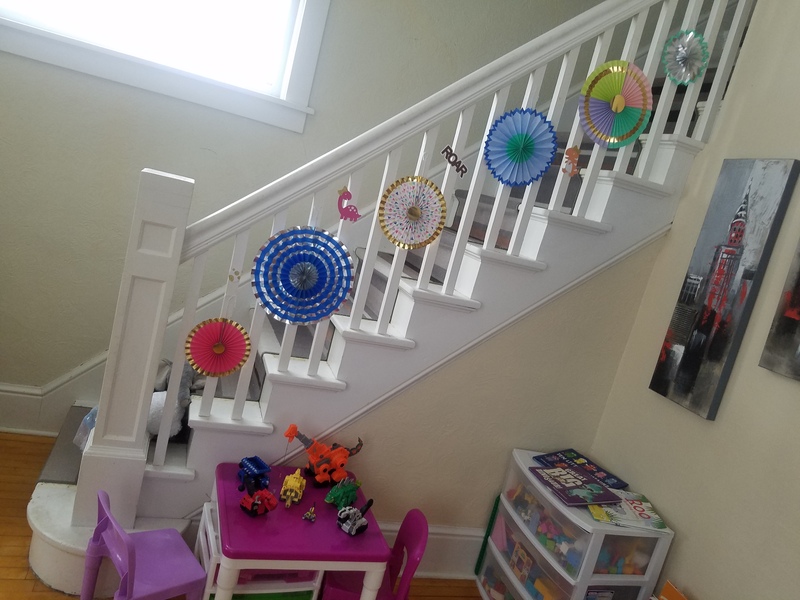 I decorated the stairs with fans from Target and the dinosaur pieces are from Etsy. 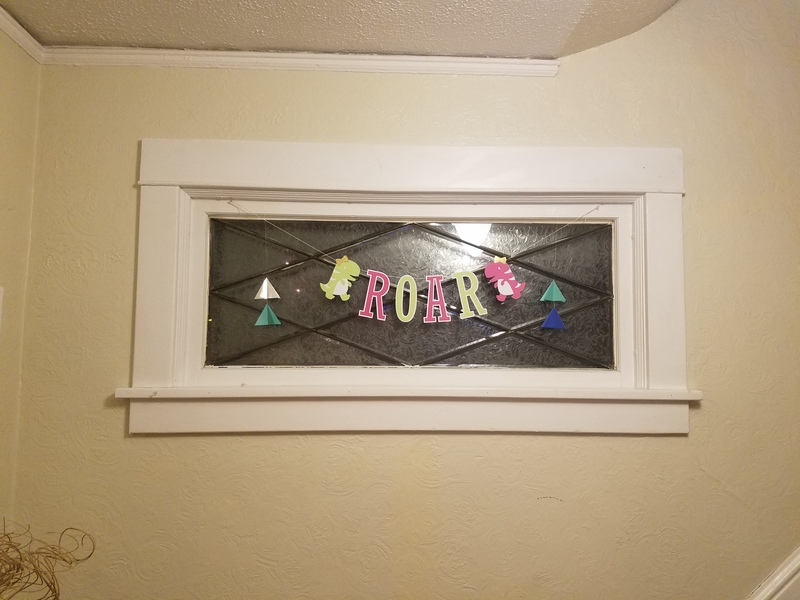 In the window, I displayed the roar banner that I bought from Etsy. 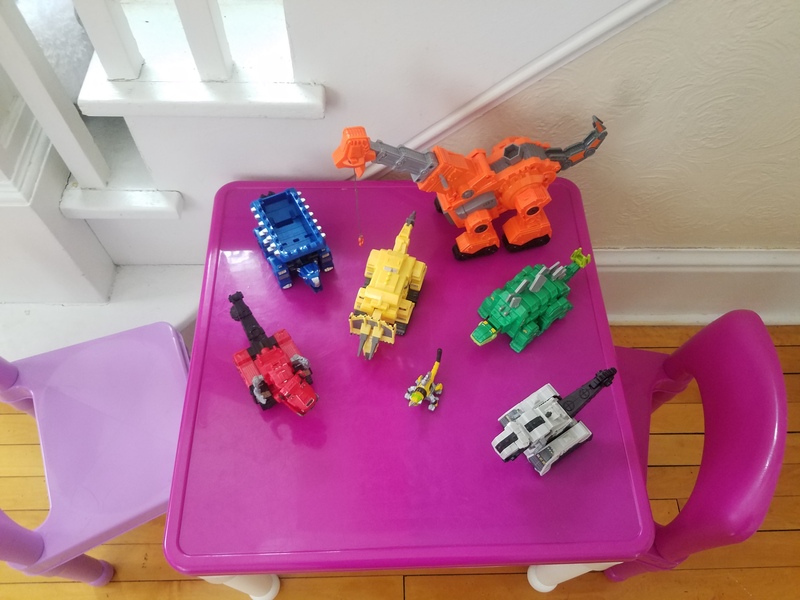 Next to the stairs, I displayed Sophia’s Dinotrux dinosaurs and her three of her dinosaur books. Also close by the stairs, I created a dinosaur scene with rock cliffs, trees, small rocks, and small dinosaurs. 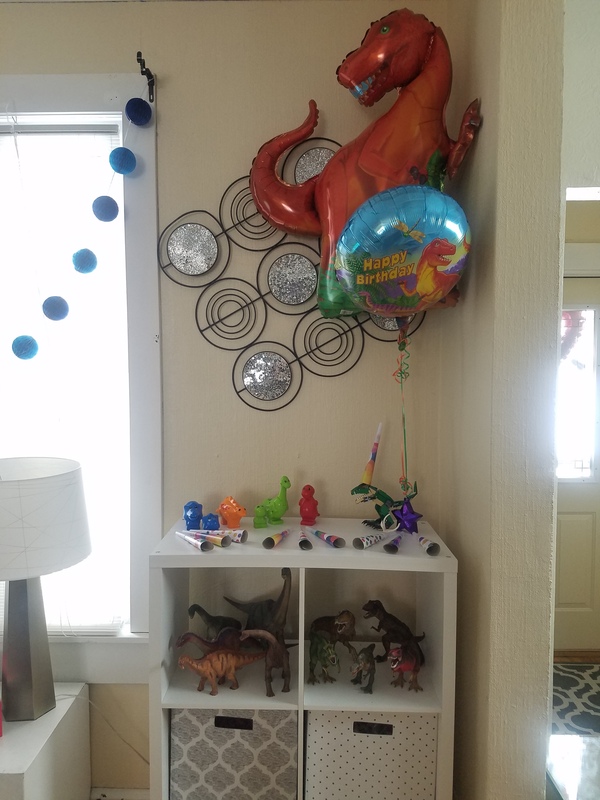 As you enter my living room, there is a six cubed shelf where I displayed the dinosaur balloons from Party America. I had Sophia’s Lego t-rex, Duplo dinosaurs, and noise makers from Target also displayed on top of the shelf. As you can see, I added a noise maker on the Lego t-rex’s head to give him a party hat. 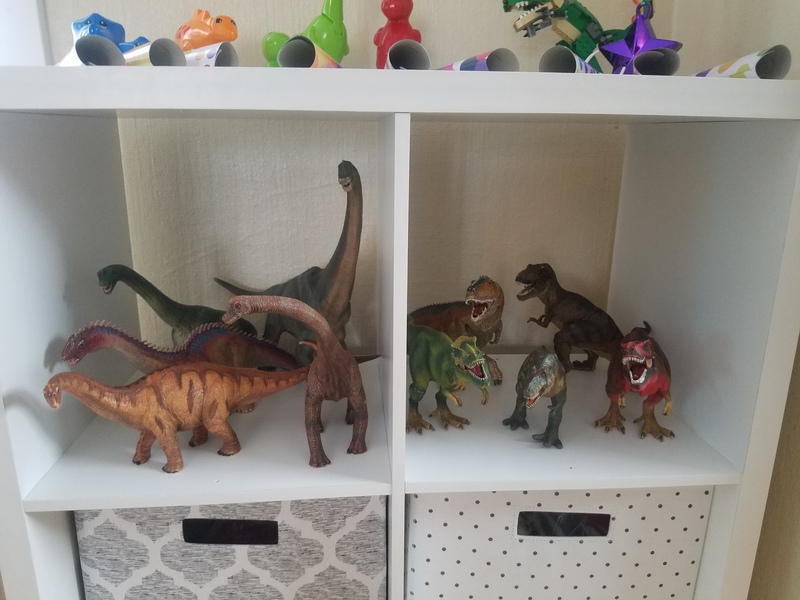 In the first two shelves, I displayed Sophia’s nice long neck dinosaurs and t-rex dinosaurs. 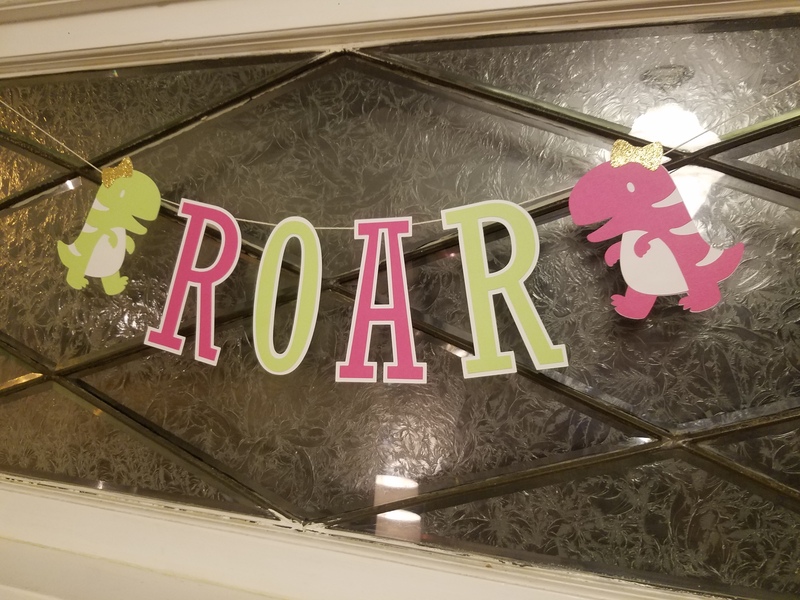 On the large window across from my couch, I hung pink and blue ball banners and a happy birthday banner (all from Target). 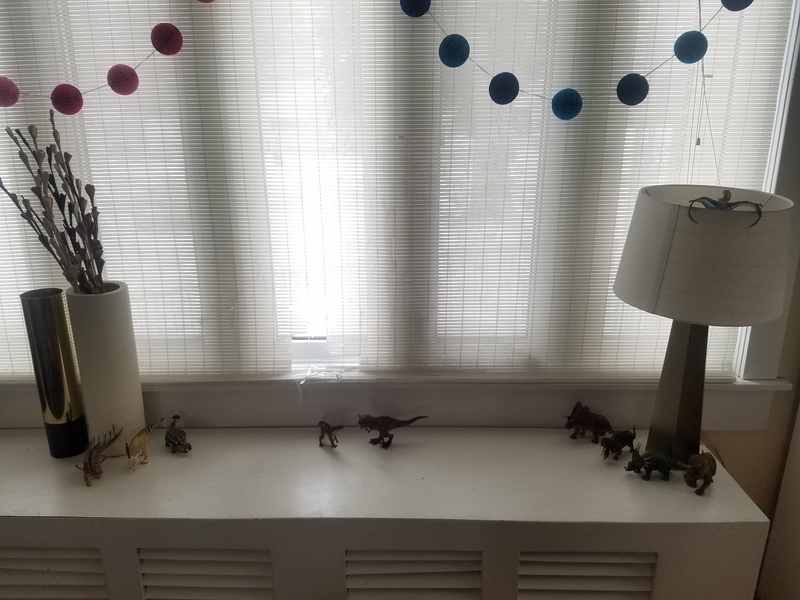 Below the window, I displayed more of Sophia’s nice dinosaurs. 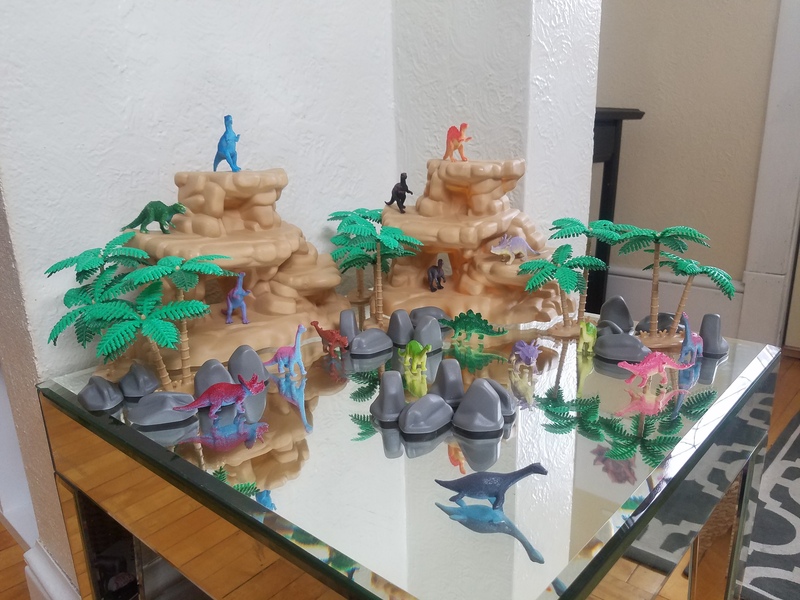 On the coffee table in front of the couch are dinosaur figure displayed from Party America with a triangle table cloth from Target. Also on the table are polka dotted party hats from Target. Next to the couch is another six cubed shelf, where I put the presents and a picture of Sophia when she was little along with some dinosaurs. 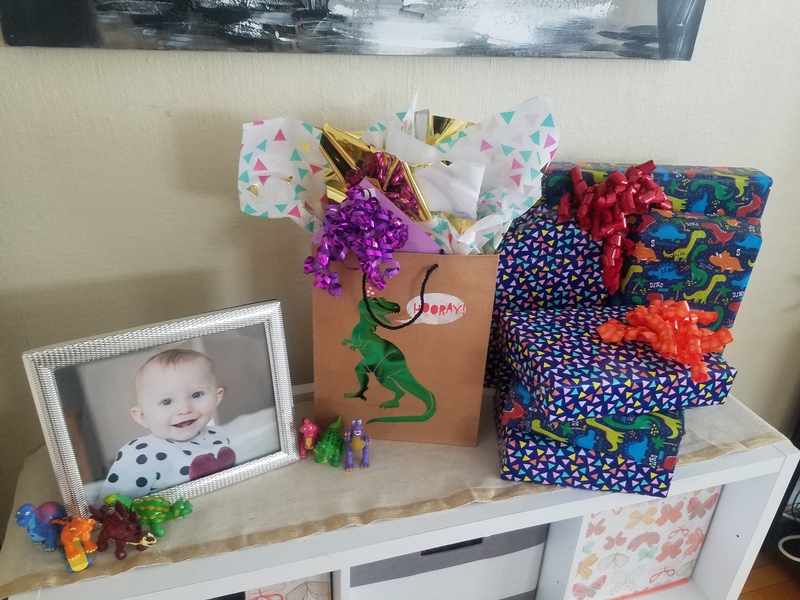 Isn’t the dinosaur wrapping paper really cute? 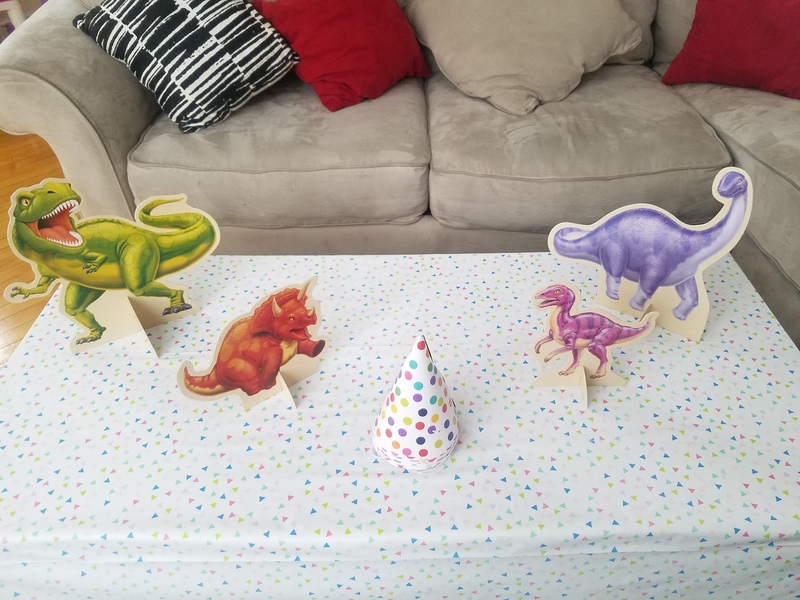 Next to the shelf is a larger dinosaur wearing a party hat. 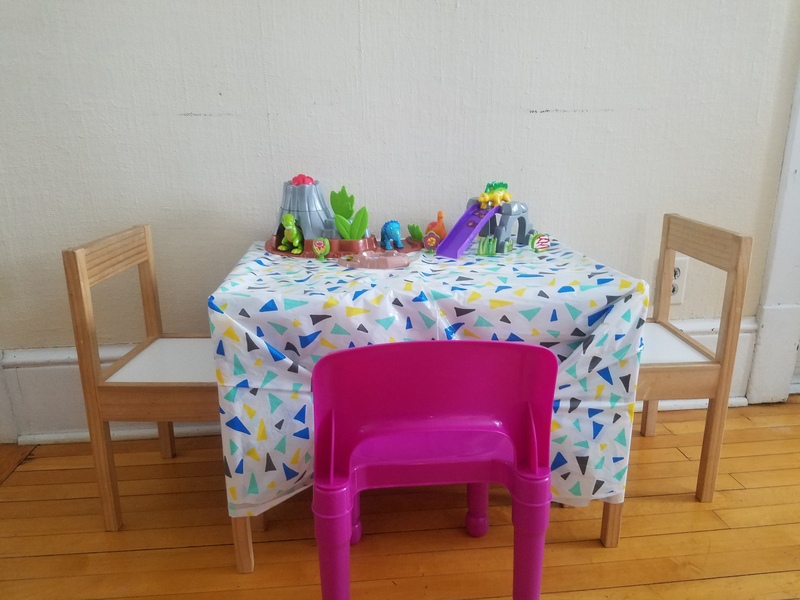 As you enter my dining room, I have a small kids table where I placed a triangle table cloth with a dinosaur volcano scene on top. 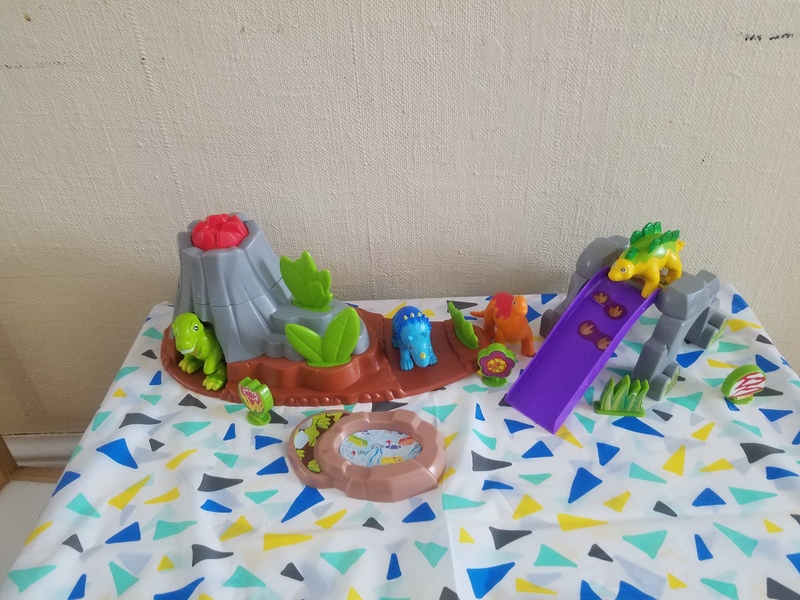 Sophia was requesting a volcano for a long time and we finally found this one, which we bought for her birthday last year. Now comes the dining room table. I hung dinosaur cutouts and red and blue ball poofs on the lights and by the window. 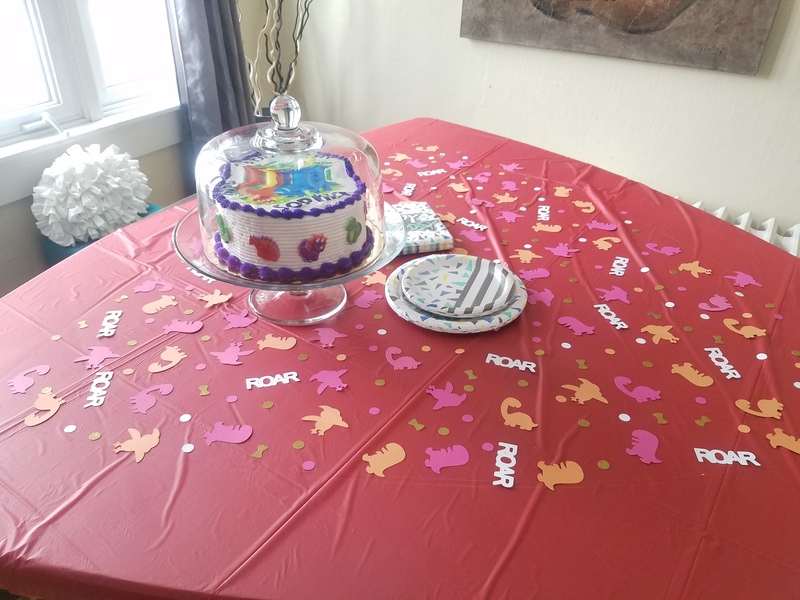 On the table is the dinosaur cake we ordered along with plates and napkins from Target. I love how the cake turned out. 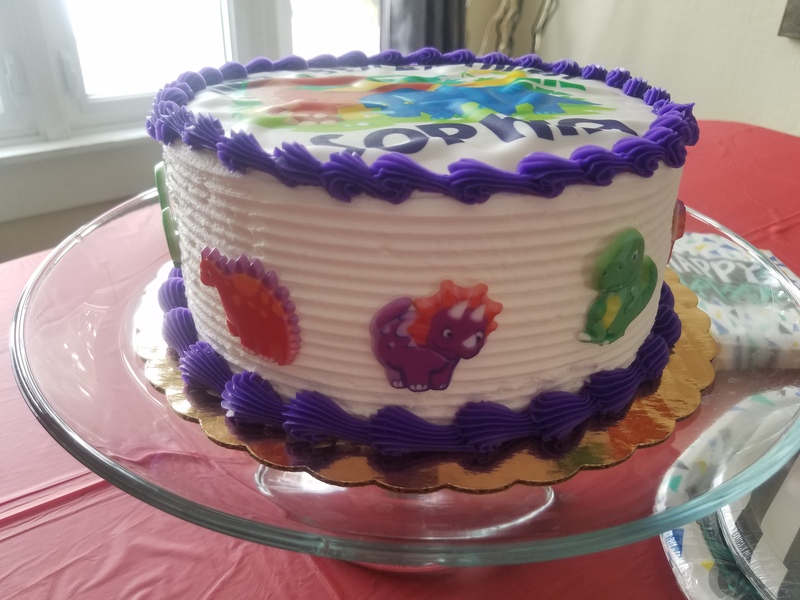 On the sides of the cake are dinosaur rings. Also on the table is the dinosaur confetti from Etsy. The confetti is so cute. 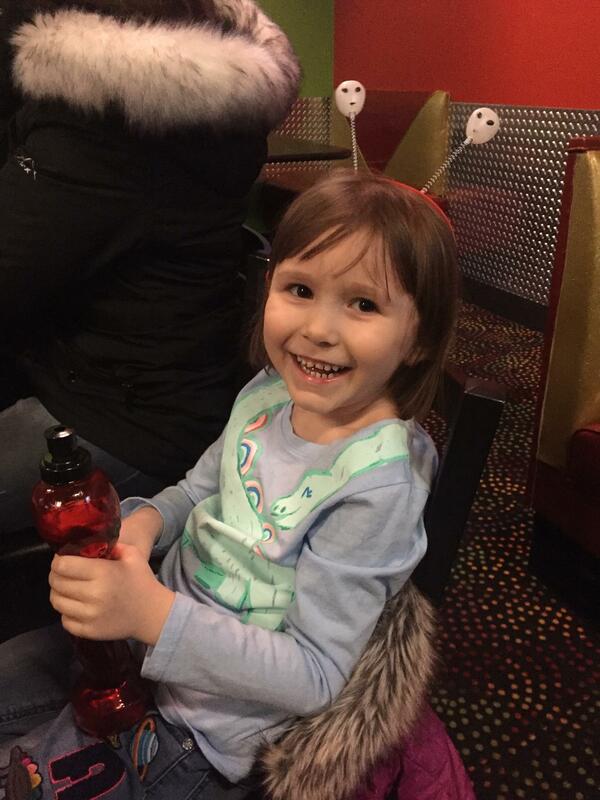 Before the party at my house started, we went for dinner where Sophia really wanted to go to – Space Aliens. 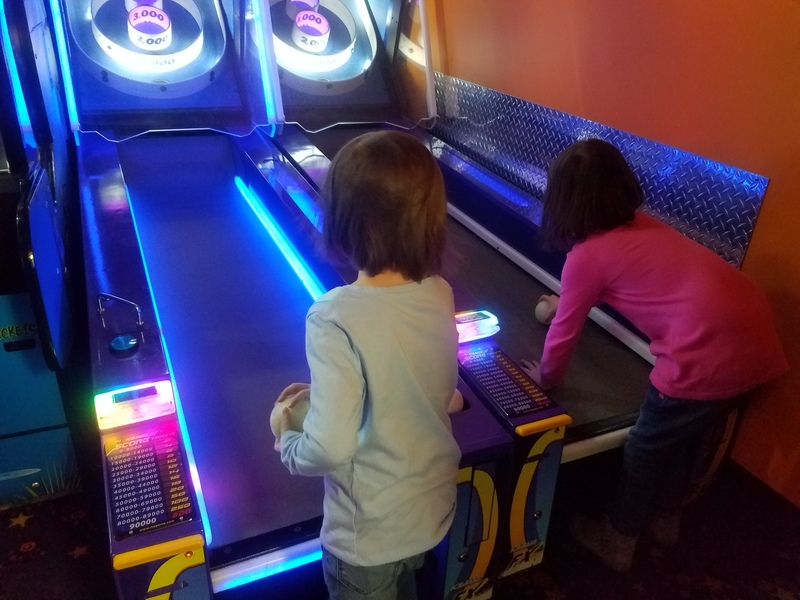 We played games and enjoyed some food while spending time with family. 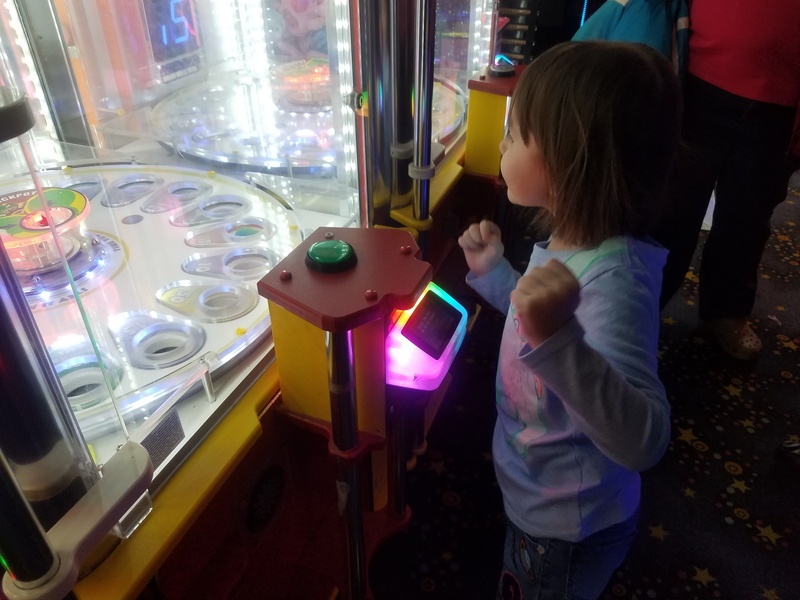 Sophia even got a birthday treat and picked out a prize before we left. 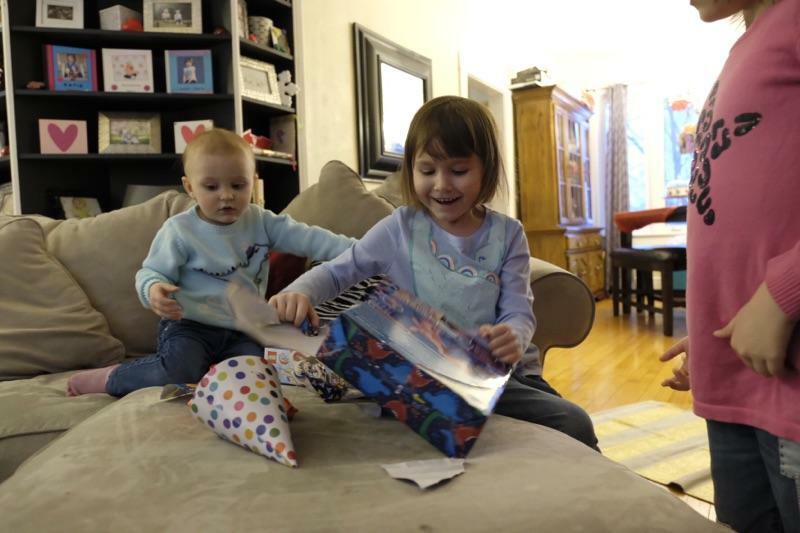 Next comes the fun part – opening up presents and having some birthday cake. 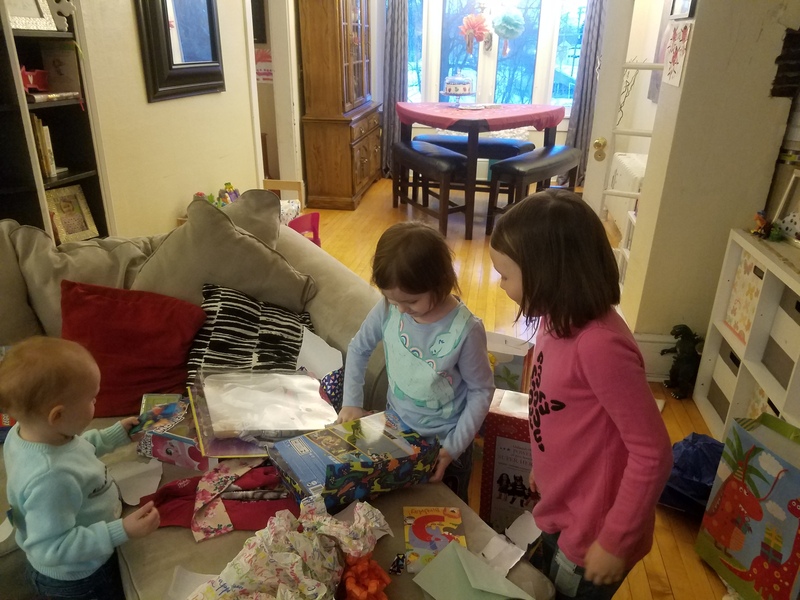 Sophia had fun opening presents. 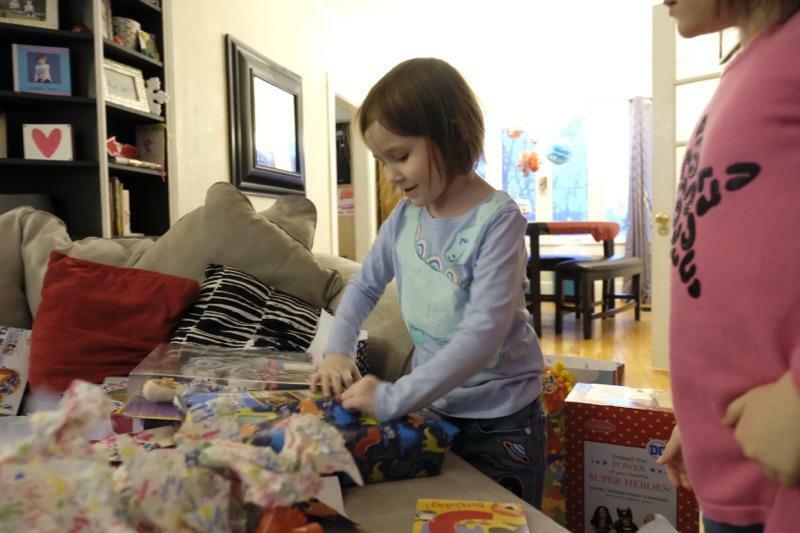 We bought her five presents this year since she was turning 5. 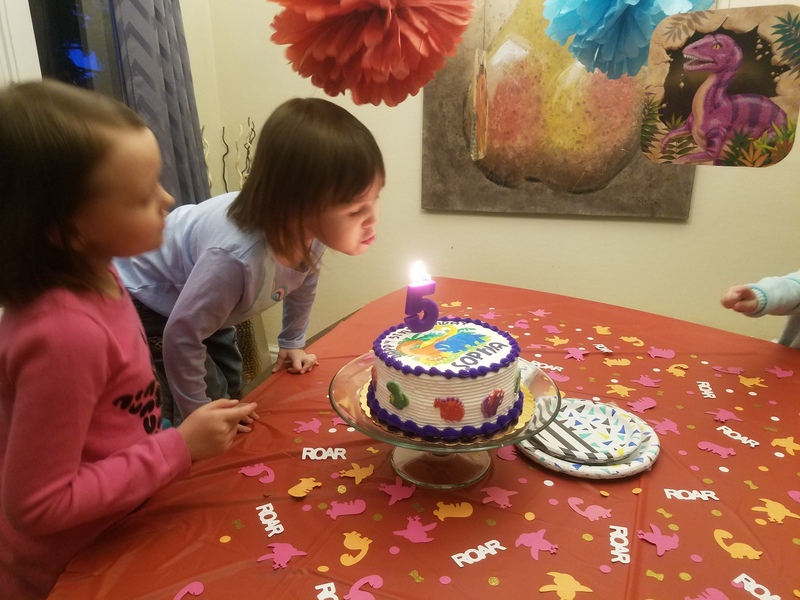 For Sophia’s birthday cake this year, she requested a number 5 candle instead of individual candles. 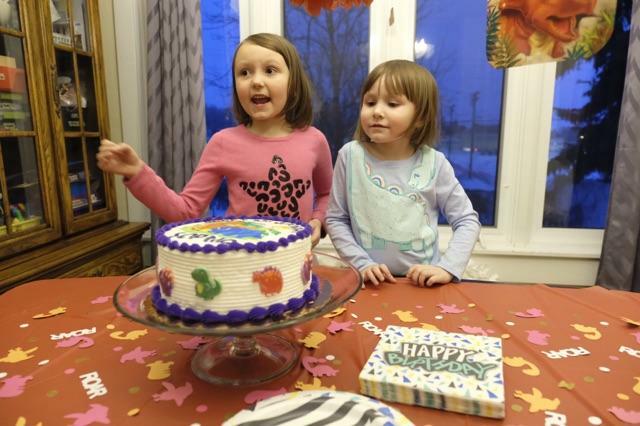 She blew her candle out and we all enjoyed some marble cake. 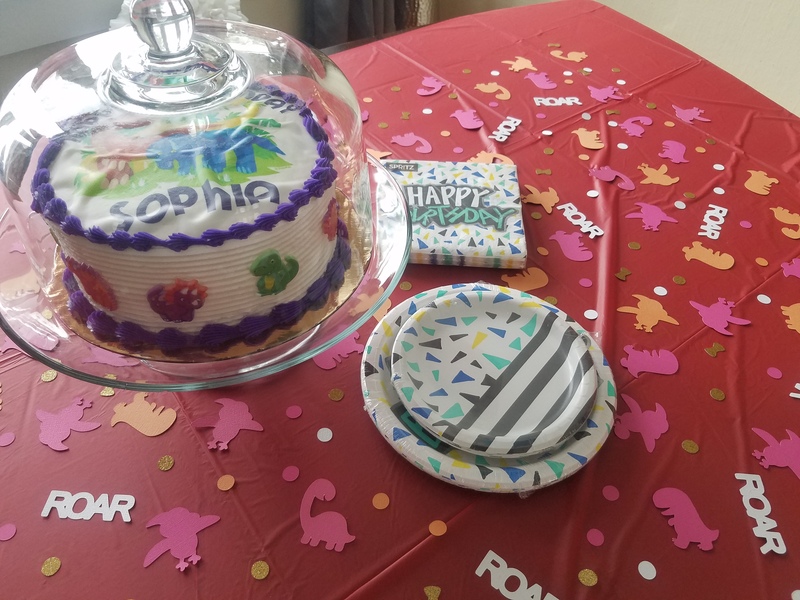 Sophia had a blast for her dinosaur party. 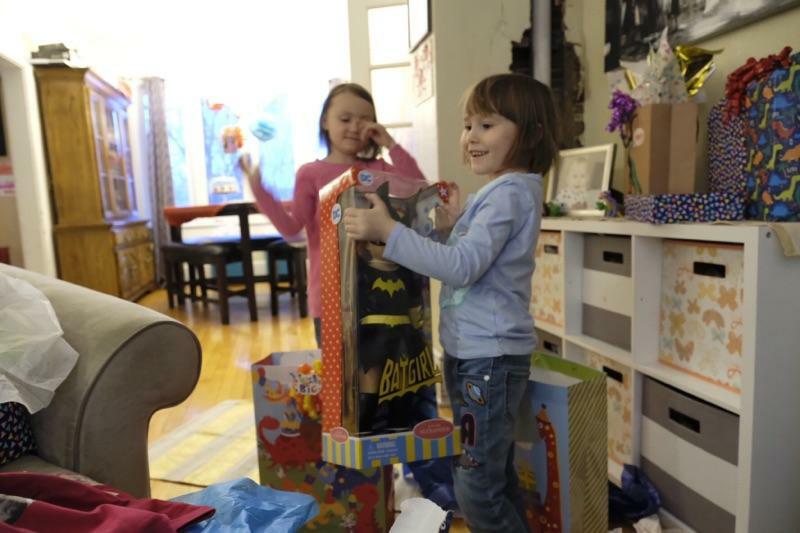 The next day on her 5th birthday, Sophia enjoyed playing with her new toys and having more birthday cake. 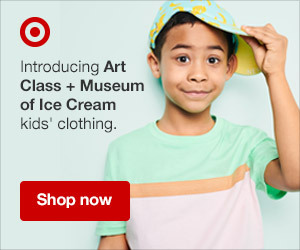 Do your kids love dinosaurs? 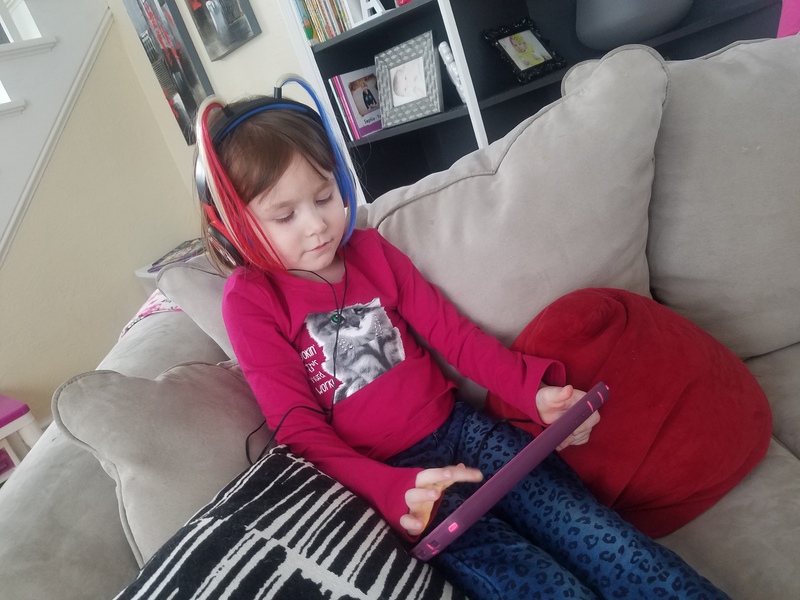 What type of themes have you done for your kids? What a great theme for a birthday part. For a while I was in charge of throwing parties for my great nephews. The first was Thomas the Train and that was crazy. We’ve been through so many variations and themes. The Thomas cake had a train with tracks on it and it was a big hit. Our next theme is unicorn when my third daughter turns two. 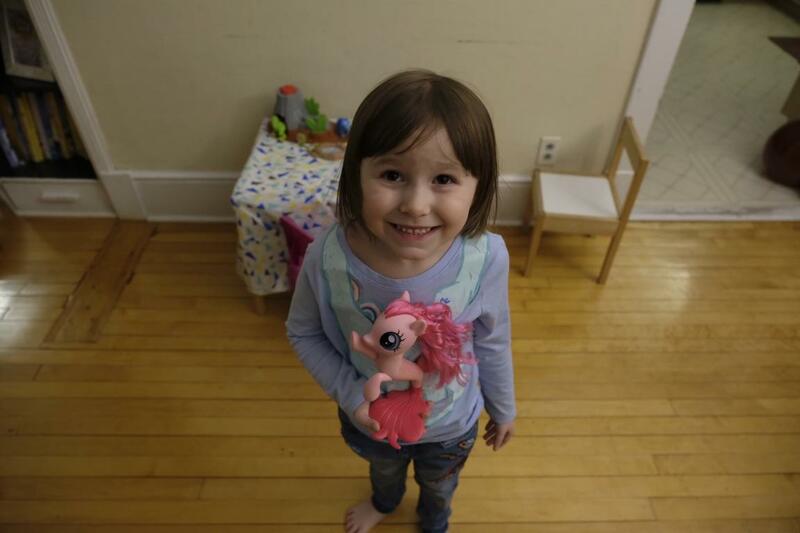 She loves unicorns. She even has unicorn boots. Thomas the Train would be fun. 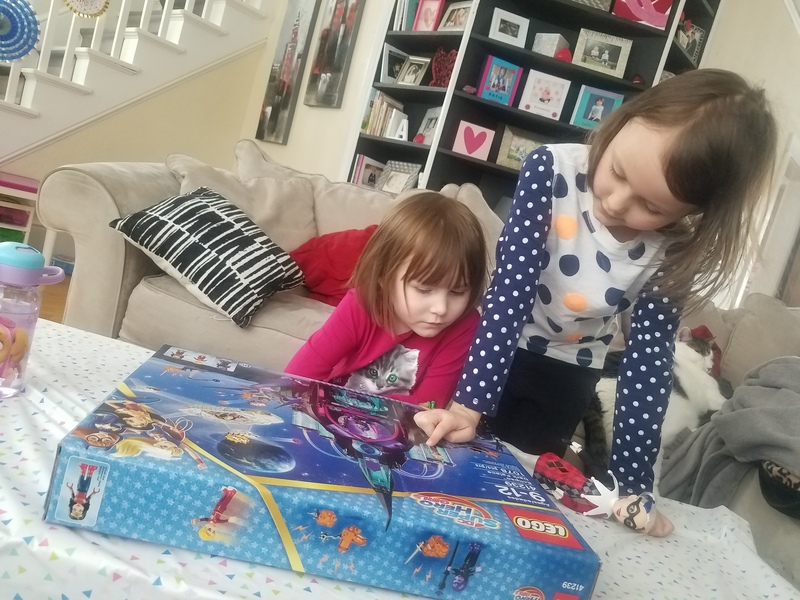 My girls love playing with trains too. They have their own train table. Now this theme is super cute. 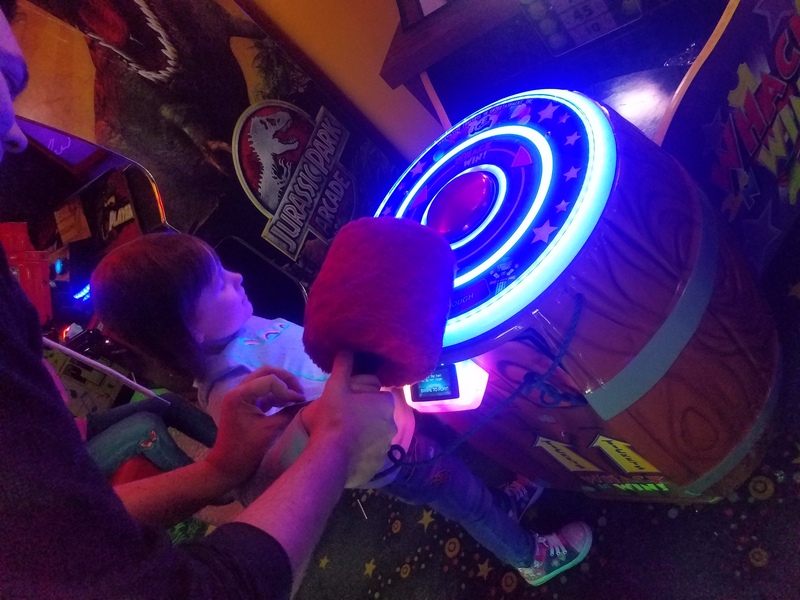 My little girl loves Dinosaurs to because of her bigger brother. So this theme would be perfect for her 4th birthday in August. The party was so fun! 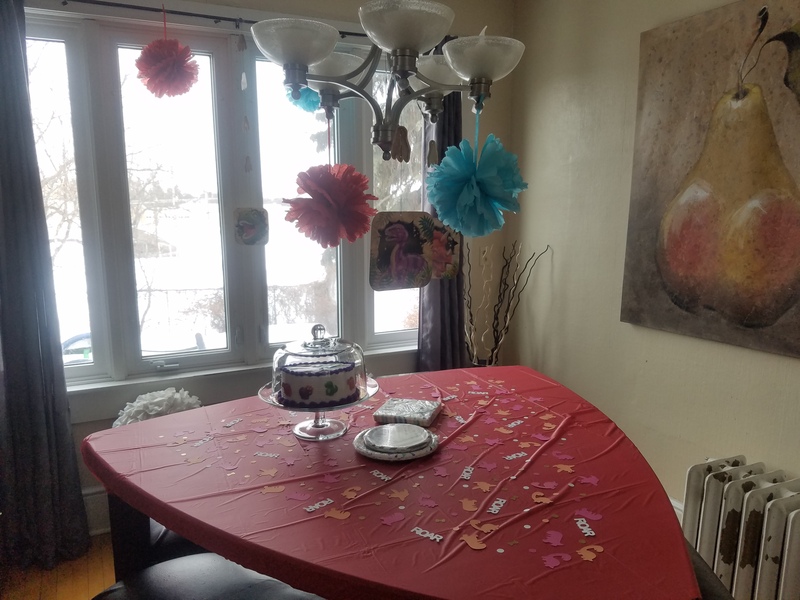 It was fun decorating my living room and dining room. 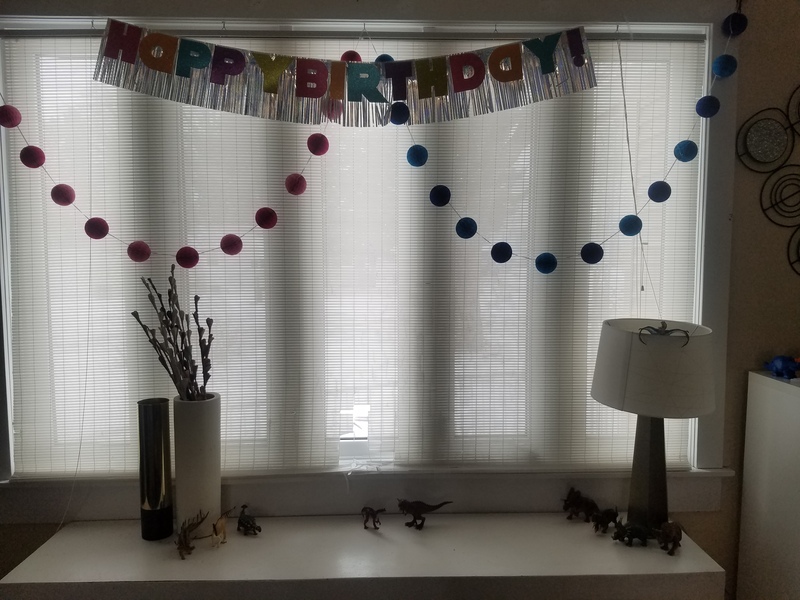 All my daughter’s dinosaur collection came in handy when decorating. Looks like your daughter had a great time at her party! I love that you told us where you found everything – searching for theme-party items can be challenging and so time-consuming! 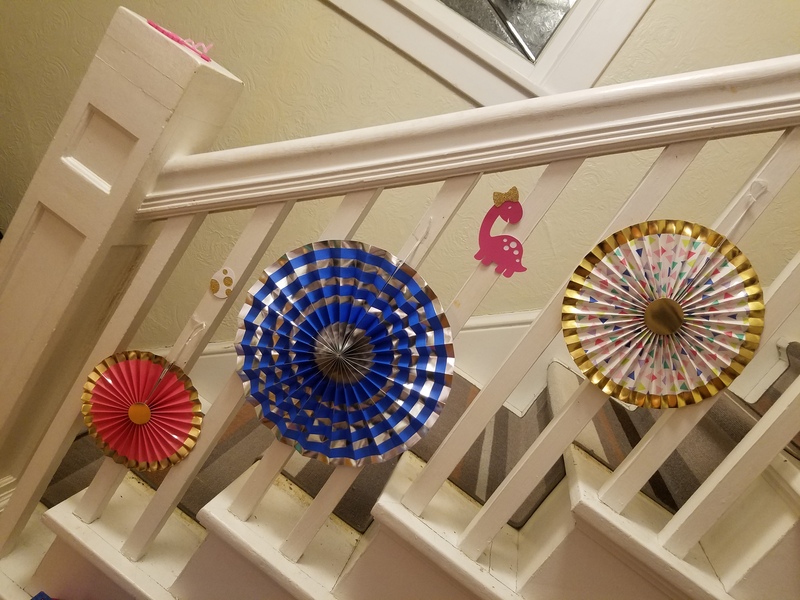 I also loved the fans – they could be used for several different themes! I agree! I was searching a month or two ahead of time to find the perfect decorations. 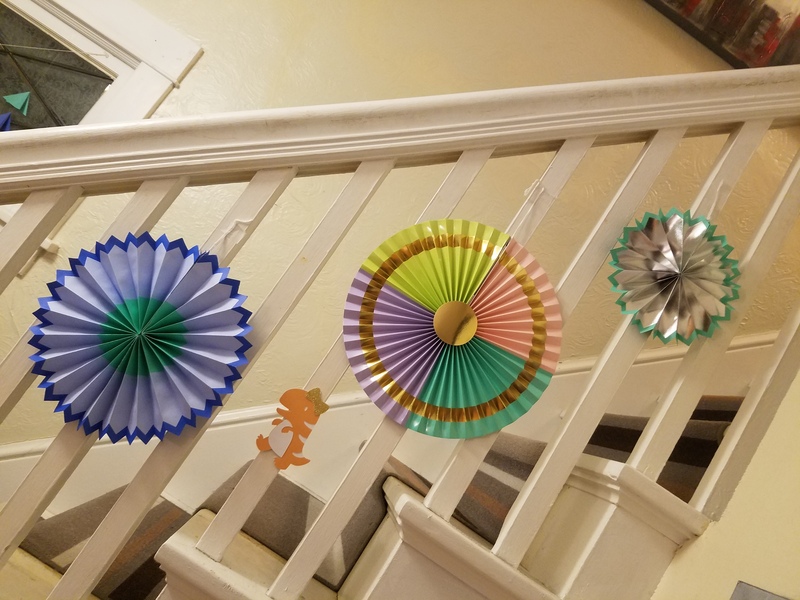 I save all of my decorations and use some of them for another birthday party. This is absolutely adorable! I love her love for dinosaurs. 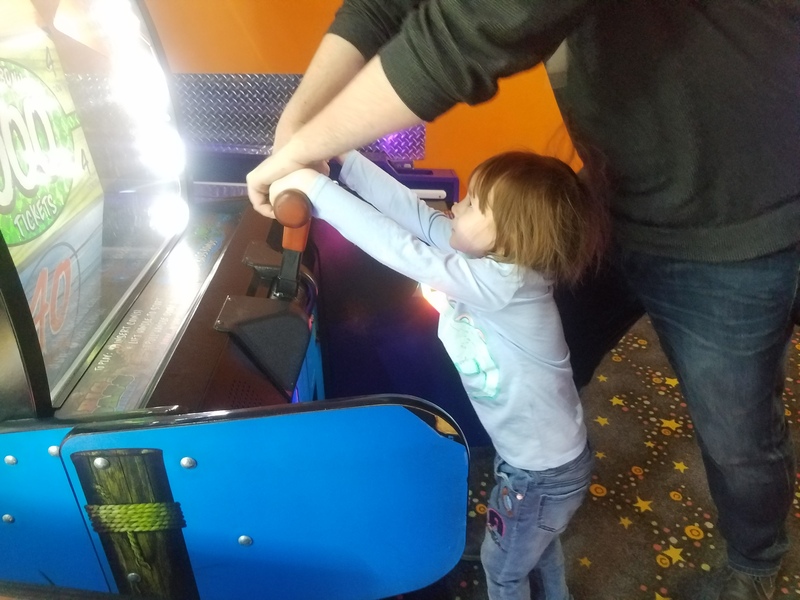 I need to save this post, because my daughter is only 1.5 years old but also seems to love dinos too! 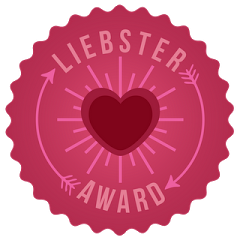 Also, kudos to you for being super creative and utilizing so many sections of your home to feature dinosaur play for the kids! Thanks! I like to use my girls’ toys in the decorations if it goes with the theme. 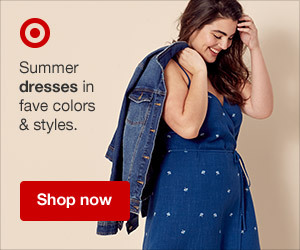 what a cute theme and idea! i love all of the decor! I found the party had idea on Pinterest. 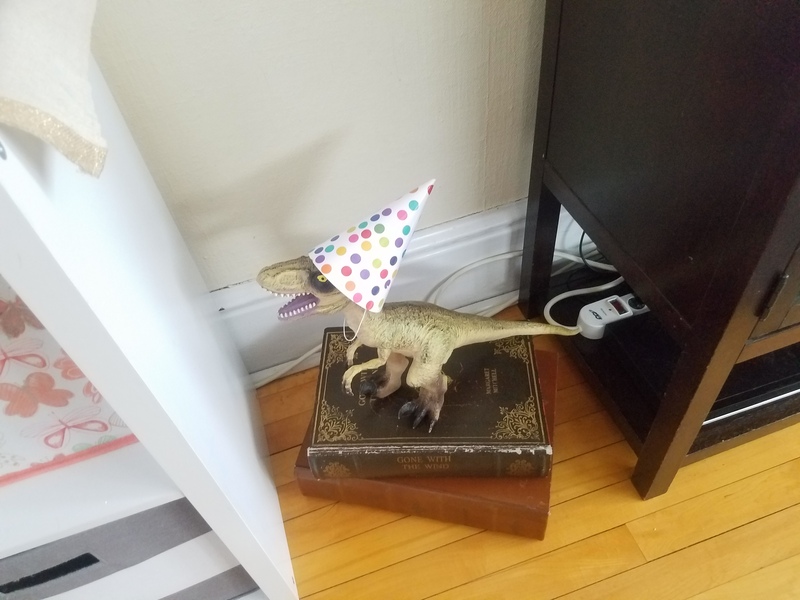 When I saw the noise makers, I knew they would be perfect for a hat for a dinosaur.